Being a fashion blogger is really fun but we tend to hoard...at least I do! I buy things randomly as I find them at the thrift stores with no thought on whether or not the color is right or if it will work well with other pieces in my wardrobe. The result of my willy-nilly shopping habits in 5 years of this madness is 2 1/2 closets of clothes that I never wear. One closet holds coats and dresses while the one in my bedroom holds separates and the remaining 1/2 of a closet is downstairs with vintage repairs and hopeful (I'll be able to fit into that some day) labels on them. I'd wake up in the morning and feel so overwhelmed with the chaos of my wardrobe that I started wearing Pj's tee shirts and some yoga pants just to avoid having to look at that mess every morning. I know- first world problem but still- such a bummer. There's no point in having things if they aren't being loved and used. So the other day I decided that the time had some to stop hoarding, start enjoying and follow through with a painful purge. D.) Does the cut flatter me? Again, be real. Is that neckline really best suited for my bust size? Does it drape well? Does it ride up or cause a lump or bump? Are those pleats really working out? If its not quite perfect, toss in pitch pile. E.) Is this really a good color for me? This was the hardest for me because I love colorful things but in general, everyone has a few colors that they should avoid. Hold up a blue shirt by your face and look in the mirror. Note your skin tone. Next, hold up a yellow shirt and note the change in skin appearance. Do this with all different colors to see which hues make you look radiant and which don't flatter. I found that yellow, yellow-green, orange and bright reds made my skin look sickly and more flushed while greens, blues, pinks and neutrals made me look bright and youthful. If its not a good color but you love the item, think about why you love it and look for something in a better suited color with similar features, toss the poor color choice in the pitch pile. We're all different so do this color check on yourself, in natural light to see what's best for you. Now tackle that pitch pile! If its in good shape or needs a small repair, you can donate or resell it. If its worn, toss it. If you have something that's really nice but doesn't quite work for you, see if a friend could use it! Now put everything back in the closet and give it another run through, one piece at a time. Did you really need to keep that thing you haven't worn in over a year? Show no mercy! No hoarding allowed! Also jot down which colors should be avoided. Keep this little cheat sheet in your purse for your next thrift adventure and you'll always bring home things that you will love to wear. Its good for your budget and good for you. Go through that massive shoe or handbag collection, even jewelry and see what needs replacements, which shoes hurt your feet or which handbags were only used once and which earrings lost their mate months ago, never to be found. Pass them on or pitch 'em. I was sad to see some of the things go but in the end, I had a closet full of things that I love and that make me look and feel my best. The other things found a new home with a friend, thrift store shopper or were retired to the big closet in the sky. Now, getting dressed in the morning is fun again because I know that everything fits, everything is in good condition and it makes me feel pretty when I put it on. I can mix and match separates with ease since I filled in the gaps. I've been having fun with outfit posts again. I can plan new sewing projects since I know what I will need next season! Best of all, I know what looks good on me and what doesn't so next time I go shopping, I can pull out my handy cheat sheet with notes from myself that say "Don't buy that, girl!!" I've been feeling the need to do this lately. I have way too much stuff in my closet. Feels so good to have a functional closet!! Good post, great process--I do closet purges about every season, and I've really gotten ruthless about hanging on to stuff that doesn't fit (which is hard, because my weight and measurements fluctuate a lot because of a GI condition, but at some point, I just have to say, you know, it doesn't fit, it is taking up valuable real estate physically and mentally, and if I do get small again, I can find or make another one, perhaps even better). You know, you can bag up the unredeemables and donate to goodwill or salvation army with a note on it "for rags" or somesuch; they will sell it to a textile recycler for the money, so you are helping the charity, keeping textiles out of a landfill, and clearing your closet!! This was great. I've seen other posts on how to pare down a cluttered closet but your way seems a lot easier and really no room for error. If it doesn't look good or fit - time to give it away. 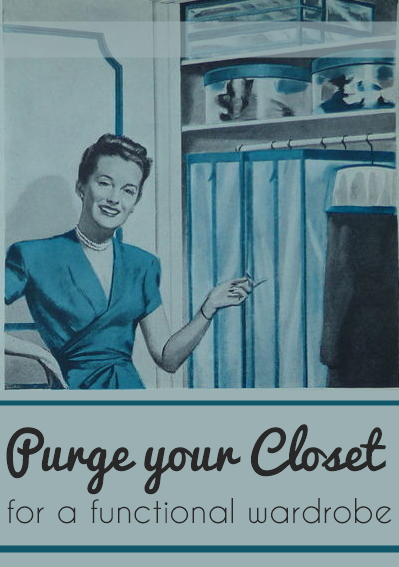 I do quite regular closet purges because I do a lot of second-hand shopping and don't have enough storage space to keep everything! I still struggle to keep my wardrobe coordinated though. And then the purging sometimes just results in a different problem, because if a piece is past it but has some nice bits of fabric still, it just ends up in the fabric stash in the craft room instead! Way to go, dear Brittany!!! This is such a stellar post and thing that you're doing for yourself. Unlike many vintage gals out there, I don't have a massive wardrobe (in no small part because genuine vintage garments have been so hard to find at thrift stores and the like for many, many years here now, plus we don't have any vintage clothing stores in my town), but I'm still ruthless with what I do have all the same and rarely hold onto something if I don't love it, it doesn't fit me well, and/or I never wear it. Living in a small condo (with matchbox sized closets), there just isn't space to keep add and add without subtracting every now and then. I love this in a way actually, because it means that I can curate a wardrobe that's filled with piece that I love and need, and most of which work really well with one another. Keep up the fabulous work - I know this post is going to help and inspire a lot of folks! Since I've only been doing vintage clothing for about six months, I'm still at that "collecting stage" (one of the reasons being that I'm too cheap to get a couple of proper vintage items online and just try to pick up ANYTHING that will work at goodwill), I will probably have to do the closet purge in a couple of years, I have definitely bought some wrong-era clothes and loud pieces that will just not work that I have regretted buying. But I'm almost afraid of letting go because I don't have many vintage things, so I will wait a little while until I get some things that I'll really like to replace them. One big thing that's hard for me is letting go of clothes because of size. What if I lose weight or gain it? I always feel like I have to have a range of sizes in my closet, everything from too big to too small. I am just switching to wearing vintage and vintage inspired everyday so I'm slowly purging my wardrobe of modern pieces that don't fit with my style. I can't wait to have a wardrobe I love with only pieces I feel good in. This is a great post, it is always good to read someone else's method of going through their wardrobe. I know I need to have another go and be more ruthless. I like the idea of the list for your purse when you go shopping. Great idea.. I need to do this too. Thanks for sharing. I did a purge not too long ago and found a ton of stuff for my upcoming etsy shop. Things that I keep telling myself I'll get into. Things I have a silly emotional attachment to...and of course things I hoard. One of the things I did when I purged a few years ago was to ask myself "do I feel amazing in this? do I feel attractive/powerful/cute/awesome?" And since then, I've only bought things that are flattering, are natural fibers, and are either very warm or very cool. I can layer for spring and fall, but in summer I want to not die (so I mostly wear paper thin cottons and linen) and in the winter I want every layer to count (so I mostly wear wool and cashmere). Why not feel beautiful and glamorous every day? If you only have AMAZING things in your closet, you will always find it easy to be amazing.